You can register now by emailing me. The purpose of this workshop is to explore the potential of expressive writing to enhance adaptation to stressful life circumstances and promote post-traumatic growth. Dr. Nurit Israeli will review evidence-based psychological findings, discuss ways of using reflective writing in her work as a psychologist, and talk about her personal journey venturing into the realm of poetry writing. Poems and other examples of expressive writing will be shared, and tools for using writing as a means of reflecting on personal experiences will be offered. Dr. Nurit Israeli holds a doctorate in psychology from Columbia University, where she was associate professor of psychology. 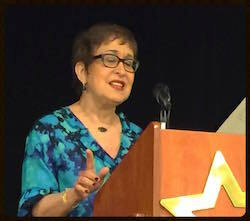 During her long career, Dr. Israeli has also been director of a family therapy department and of training programs in psychology, faculty and supervisor at postdoctoral programs in couple's therapy, and a member of the committee of accreditation of postdoctoral training programs in family psychology of the American Psychological Association. Nurit has published poems in international poetry anthologies, the New York Times, the Writer’s Digest, and other online and print magazines. Several of her poems won awards in writing challenge competitions.